Known as the White City, Arequipa is Peru’s second largest city and the capital of the region of the same name. Arequipa was a highly important economic center during the Colonial period, and was even capital of the country for a time after Peru gained independence from Spain. >> Want to go? Visit Arequipa on one of our 3- or 4-day Arequipa tours! Today, the city is known for its alpaca and vicuña fiber industries and other manufactured goods. Arequipa has one of the most gorgeous historic centers in all of South America, and is actually a UNESCO World Heritage Site. Colonial-era buildings in the so-called “Escuela Arequipeña” style adorn its main plaza, gleaming white due to the locally-mined volcanic rock, known as sillar, used in their construction. Located at 2200m (7218 ft), between the high Andes Plains and the desert coastline, Arequipa enjoys a superb climate: warm and sunny during the day, and cool at night. 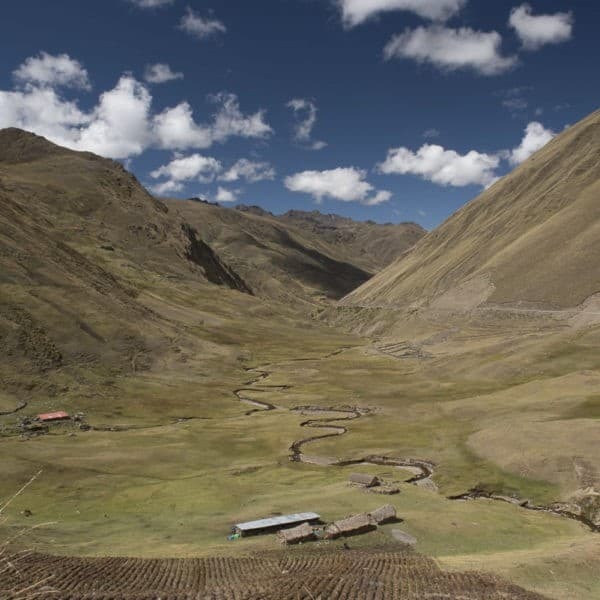 December to March is considered the rainy season, but this usually means that there is a cloud cover with occasional rain as opposed to the heavy downpours typical of the Peruvian Andes. Arequipa is also ringed by volcanoes: Misti, the classic conical volcano whose last eruption was in 1985; Chachani, a very popular climbing option; and Picchu Picchu, a double-peaked, inactive volcano reaching a height of 5664 m.
Arequipa is filled with fabulous architecture, from neoclassical to Baroque styles. One of the most interesting attractions is the Santa Catalina Convent, located right in the heart of the historic center. It is like a town within a town! In the colonial days of the early sixteenth century, there was a tradition indicating that the second son or daughter of a family would enter a life of service to the Church. Santa Catalina accepted only women from upper-class Spanish families. There are still a small number of nuns living at the convent to this day. 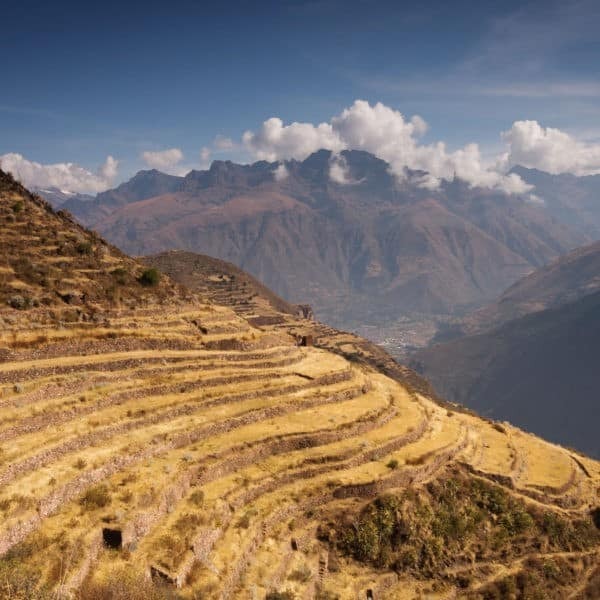 However, Arequipa is likely most notable for its proximity to the famous Colca Canyon, one of the deepest in the world – second only to neighboring Cotahuasi Canyon – and notable for the abundance of condors who soar through its depths. >> Don’t miss out! 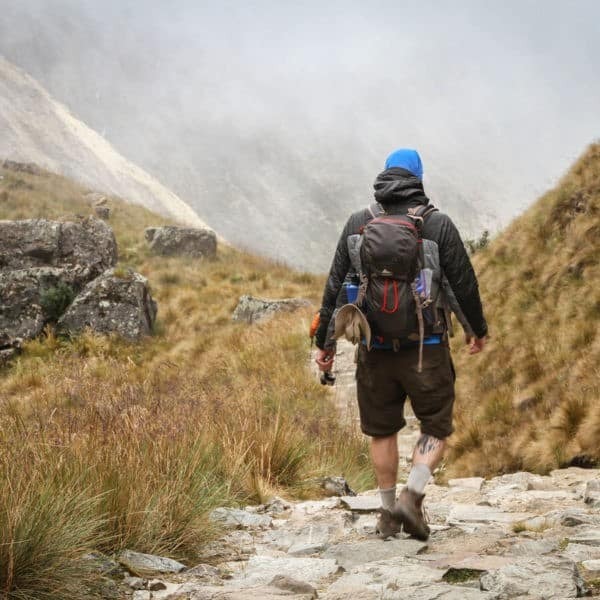 We offer fabulous 3- and 4-day tours that capture the highlights of this region, great extensions to add to any Andean trek and also a perfect way to slowly acclimatize to the high altitude! Cruz del Condor (Condor Cross) is a popular spot from which one can see majestic condors soaring on the thermal vents between the canyon walls. Winding along the base of the canyon runs the Colca River. Visitors also have the opportunity to visit some interesting towns such as Maca and Pinchollo, which still maintain their authentic Andean traditions. Those who enjoy a good soak can take advantage of the relaxing hot springs located in the main town of Chivay. En-route between Chivay and Arequipa lies the Pampa Cañahuas National Reserve, which is the best place to catch a glimpse of the elusive and graceful vicuña. If you like spicy food then you should definitely try some of the renowned local dishes, such as rocoto relleno, a spicy meat stuffed chili pepper, or ocopa, potatoes topped with a creamy yellow pepper sauce, similar to papa a la huancaina common in Cusco. Arequipa also boasts delicious seafood dishes, such as its famous chupe de camarones, shrimp chowder. Las Torres de Ugarte is very central, next to the Monasterio de Santa Catalina, and a great Arequipa hotel. The rooms are small, but nice and colorful. Ask for a room opening onto the patio as they are just charming! The Hotel Casona del Solar is a historical house turned hotel in Arequipa, wonderfully renovated and decorated, with big, clean, comfortable bedrooms. The sunny courtyard at the back of this Arequipa hotel is beautiful and a quiet place to relax. It is within walking distance of the plaza, but not very close. Located very near to Arequipa’s gorgeous Plaza de Armas, the Tierra Viva Arequipa offers the same high standard of accommodation found in other cities. A boutique hotel, it is decorated with famous Arequipeño artists’ works, and also features an excellent rooftop terrace where you have views of the surrounding volcanos. A great option for hotels in Arequipa! contemporary touch, making this one of the best Arequipa hotels! Located right on the Plaza de Armas of Arequipa, you don’t get locations better than this! Travelers rave about the views from the Rooftop Bar & Restaurant which are phenomenal. The rooms of this Arequipa hotel themselves are clean and adequate, though a little noisy. Recently renovated, the Libertador Arequipa is part of a luxury chain of Peru hotels. The hotel is located in a gorgeous colonial building in the Selva Alegre District of Arequipa (several blocks up from the center) and features a lovely swimming pool, gardens, a few animals roaming about, a playground and all the other amenities of a hotel of its class, including elegant reception areas. Perhaps the stateliest of the Arequipa hotels this is a grand dame of Arequipa, and a memorable stay! As a hotel chain, Aranwa do well converting historical properties into elegant, first class and modern hotels. At the “Enchanted Village of Colca,” the old water mill welcomes you to the hotel. Located at the bottom of the valley, outside the village of Chivay, this Colca Canyon hotel offers seclusion and is way off the beaten track. Rooms are of a high standard, though this area is cold and people mention that if you upgrade to a chalet you will get a fireplace to warm your room! With funky colorful architecture, large rooms and mountains all around, the Killawasi hotel in Colca Canyon provides a rustic escape from the busyness of everyday life! Swing from a hammock, or relax on your private balcony. People love staying at the Killawasi as their Colca Canyon hotel. Ask at the hotel about their daily excursions. One of the most important aspects of the Colca Lodge is that they have their own private hot springs. The four pools, which have different temperatures, are open 24/7 for guests, and you can watch the stars from them. Better still, there is a bartender available! The Colca Lodge is definitely one of the best hotels in Colca Canyon, and worth the splurge. Belmond Las Casitas is a luxury hotel that provides a wonderful stay in the peace and serenity of Colca Canyon. As the name suggests, each of the rooms are houses (casitas) which offer privacy and an exclusive stay. There are ample lawns and gardens, as well as alpacas wandering about. Other features include a world class spa and the opportunity to spot condors overhead. As this Colca Canyon hotel is located on a hill, if you are not easily mobile it is best to request a room near reception.